For our office, the hubby and I had to agree on the decor because we share the area. Yeah, it was tough. We both wanted something that covered the entire wall behind our computers; I wanted something flowery, he wanted something video-gaming (yes, he is a gamer...)- thus we had a dilemma. It wasn't until I found blockposters.com that we finally agreed. The process is really simple and easy to do. 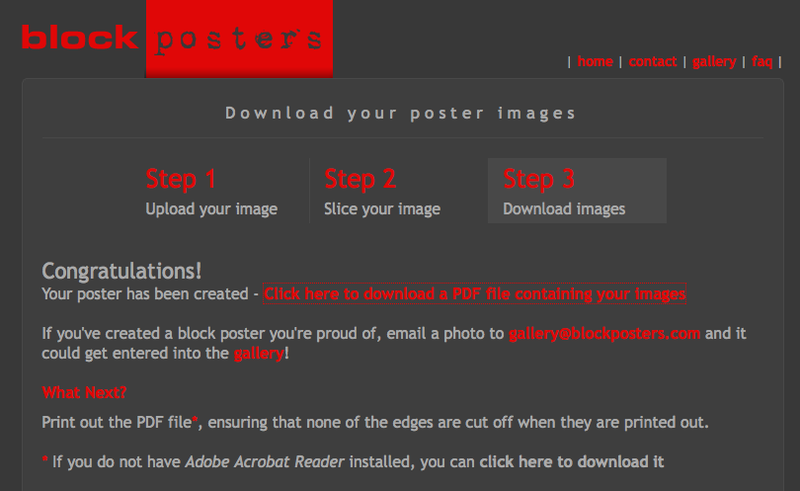 Step one: Upload an image. 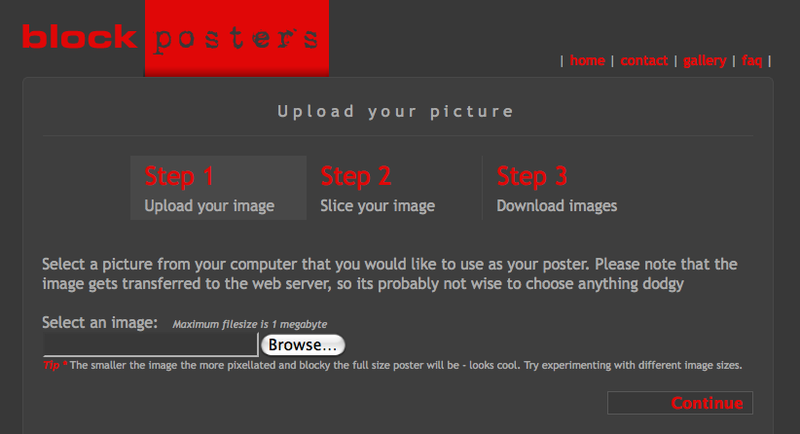 We chose a picture from digitalblasphemy.com. The image you upload can't be larger than 1mb so you may need to resize. 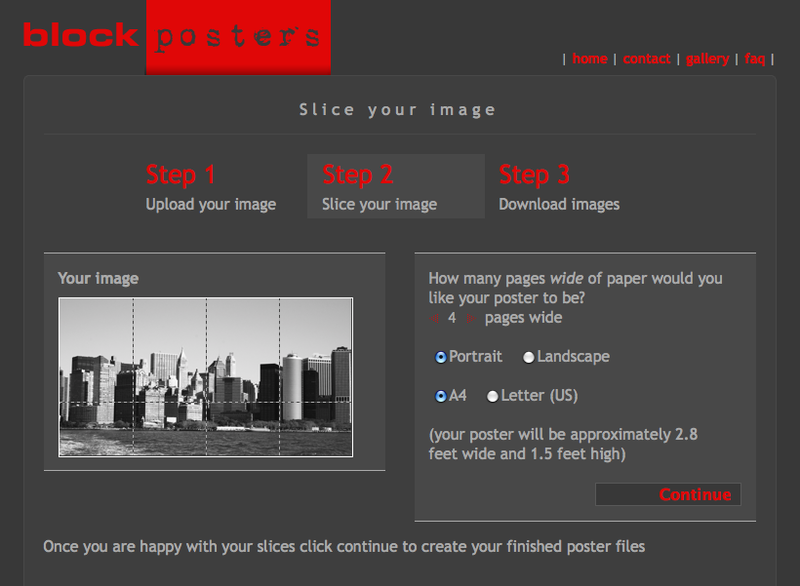 Step two: Choose how large you want your image and what position you want it in. We chose landscape with it being 5 pages wide, 6 pages tall. Step three: Your image is then made into a PDF that you can print off on your home computer. Step four: There will be a white edge around each page that you'll need to cut off. Step five: Attach the sheets of paper to your surface. We used 3m mounting squares cut into tiny pieces in each corner. We then eyeballed each piece as we attached them to the wall. Voila! 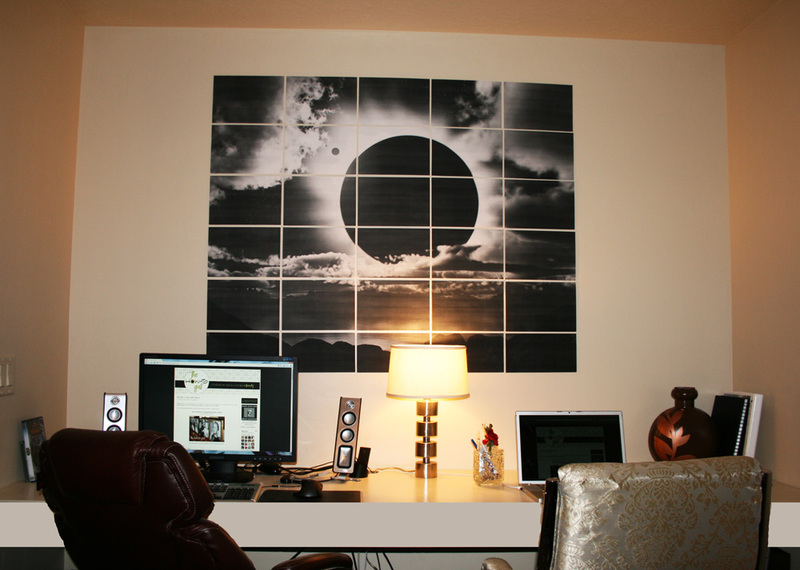 The perfect gender neutral office space art for Mr. How-To and me for less than $3. I think this project is so versatile. Imagine the possibilities. Print the pictures in color and do a large family photo or your teenage daughter's latest celebrity crush. If my hubby would have let me, this image would have been the New York skyline, a huge damask print or a chevron pattern. Seriously, the possibilities are endless! Thank you Thank you!! I already made one@!!!! I love this idea. Really love it. I want to have a huge picture of me and Joe. HUUUUGE. I'm thinking of producing a large poster of my collection of slightly worn spoons.